The Global Volcanism Program has no activity reports for Michinmahuida. The Global Volcanism Program has no Weekly Reports available for Michinmahuida. The Global Volcanism Program has no Bulletin Reports available for Michinmahuida. 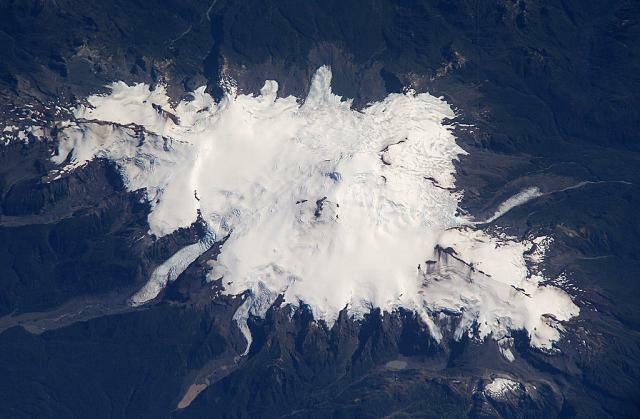 The glacier-covered basaltic-to-andesitic Volcán Michinmahuida, located west of Lago Reñihue, has a saddle-shaped summit with an elongated 3-km-wide caldera. The massive edifice is elongated in a NE-SW direction, and a youthful eruptive center is located on the ENE side of the complex. A major explosive eruption at the beginning of the Holocene produced the Amarillo Ignimbrite that may have created the now ice-filled summit caldera, and Holocene tephra deposits from summit and flank vents have been identified. An eruption was reported in 1742. Darwin observed activity in 1834 on his renowned voyage that took him to the Galápagos Islands. The latest known eruption, from February to March 1835, produced a lava flow from a flank crater and lahars that reached the coast at Punta Chana. There is no Deformation History data available for Michinmahuida. There is no Emissions History data available for Michinmahuida. Glacier-covered Volcán Minchinmávida is elongated along a NE-SW direction. The volcano has a mostly obscured 3-km-wide caldera, and a youthful eruptive center is located on the ENE side of the complex. An eruption from Minchinmávida was reported in 1742. Darwin observed the volcano in activity in 1834 on his renowned voyage that took him to the Galápagos Islands. NASA Space Station image ISS006-E-42260, 2003 (http://eol.jsc.nasa.gov/). There are no samples for Michinmahuida in the Smithsonian's NMNH Department of Mineral Sciences Rock and Ore collection. Large Eruptions of Michinmahuida Information about large Quaternary eruptions (VEI >= 4) is cataloged in the Large Magnitude Explosive Volcanic Eruptions (LaMEVE) database of the Volcano Global Risk Identification and Analysis Project (VOGRIPA).